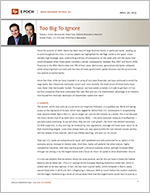 Too Big To Ignore - Epoch Investment Partners, Inc. Since the summer of 2005, Epoch has been wary of large financial stocks, in particular banks. Leading up to and throughout the crisis, in various papers we highlighted the red flags visible in the space: unsustainably high leverage; poor underwriting and lack of transparency on the asset side; and the equity that would disappear when those assets inevitably crashed. Subsequently, between May 2007 and March 2009, financials in the MSCI World Index lost 79% of their value. Well-known, generations-old banks collapsed, while remaining titans survived with the help of timely government capital infusions and the accommodative policies of central banks. Since that time, while we have invested in an array of non-bank financials, we have continued to avoid the large banks. But imbalances eventually correct and, more recently, the share prices of these banks have risen faster than the broader market. Throughout, we have asked ourselves: is it safe to get back in? Can we find companies that have sustainable free cash flow and use it to shareholders’ advantage in an industry that housed the most epic destroyers of shareholder capital ever seen? The answer, which may come as a surprise to our long-time followers, is a qualified yes. We’re still taking a pass on the big banks of Europe, which have lagged far behind their U.S. counterparts in recapitalizing their balance sheets. But in the U.S., we no longer can rule out the industry as a whole. This is not because the macro factors that drive bank return on equity (ROE) — the most important measure of profitability — are particularly promising. As we will show, they are not. Loan growth, the most vital element necessary for ROE expansion, is slow and may be hindered by new regulations. Leverage will likely never return to its ROE-maximizing heights. Costs have already been cut, new opportunities for non-interest income are few, and the release of loss reserves, which has inflated earnings, will soon run its course. That said, U.S. banks are extraordinarily liquid, well capitalized and well positioned for an upturn in the economy and an increase in interest rates. Until then, banks will perform like other mature, highly competitive industries, with slow top-line growth, a focus on expense control, perhaps increased M&A (though not among or by the largest banks) and a focus on return of capital to drive shareholder returns. It is this last element that we believe shows the most promise, and for this we have to thank the Federal Reserve and its stress test. (This is in contrast to the European Banking Authority’s stress test, which is widely seen as far less rigorous. In fact, the two main Cypriot banks, which collapsed in March, easily passed these tests in 2010 and 2011.) Beginning in February 2009 (a month before the market’s bottom), the Fed began implementing a series of annual stress tests that the largest banks would have to pass by a wide margin to first demonstrate their viability and eventually to obtain permission for dividend payouts and share repurchases. The banks’ increasingly strong performance on these tests, which have grown more refined and granular with each year, along with decent operating results have given us confidence that banks can generate excess capital — i.e., free cash flow — and priced correctly are worthy, potentially lucrative investments for our clients. What is a bank . . . a good business? What would one pay for a business with an 86% gross margin in its main business line and a 38% pre-tax cash operating margin? That is what the U.S. banking system in its entirety earned in 2012.1 There are myriad reasons, mainly leverage and credit risk, why the answer to that question is “a lot less than a comparable non-bank business.” The market bears this out, as the XLF (an S&P financials ETF) trades at 13x forward earnings while the SPY (an S&P 500 ETF) trades at nearly 15x. But that doesn’t mean one can’t make money in bank stocks, especially since a repeat of the 2008-2009 credit disaster has been taken off the table by the stress test. At its roots, a bank is a leveraged aggregator of diverse credits funded by low- to no-cost deposits. The leverage and low- to no-cost funding distinguish it from, say, a fixed-income mutual fund. It buys money, marks it up and resells it. There is no other business, not even Warren Buffett’s beloved insurance, where customers line up to warehouse their money in an enterprise with little expectation of return, and in the case of checking accounts, full knowledge of no return! Banks do pay for the privilege of housing these deposits via the FDIC insurance wrapper: in 2012, U.S. banks paid assessments of $12.4 billion, on average insured deposits of $7.2 trillion (17 bps). Considering banks earned nearly 4% on earning assets (loans and bonds) in 2012, at an overall interest cost of 54 bps (not including the FDIC assessment), insured deposits are still a very attractive source of funding available only to banks. And we haven’t even included interchange income, wire fees and overdraft fees earned in the course of allowing the customer to access his or her funds on a regular basis. It is true banks spend a fair amount of money in gathering and servicing these deposits, be it on large branch networks or IT systems. This is captured, however, in the non-interest expense, with the net result showing a “cash” pre-tax margin of 38%. So far, so good. The flip side of gathering all of these deposits is that they, by definition, make banking a highly asset-intensive business relative to other industries. The clearest way to demonstrate this is to look at the revenue generated by the financial and non-financial businesses of GE. In 2012, GE Capital generated $46 billion of revenue from average assets of $560 billion, while the rest of GE generated a little over $100 billion of revenue, on average assets of $140 billion. In other words, GE’s broad portfolio of industrial and other businesses generated over twice the revenue on a quarter of the assets. So a bank has a portfolio of assets that doesn’t turnover very rapidly yet when it does it generates a decent return. The last component of the classic DuPont ROE model is leverage, and here lies the “good” and the “ugly” of the basic bank model (we skip the “bad” because the effect of leverage on bank performance is almost always ugly, especially during the most recent crisis). Figure 1 depicts system-wide assets to equity of all FDIC banks since 1984, the earliest date for which we have complete combined data for commercial banks and thrifts. Source: FDIC Quarterly Banking Profiles, Epoch Investment Partners. For a complete data set of net income, gross revenue, assets, equity, net income/gross revenue, revenue/average assets, average assets/equity, industry ROA, industry ROE, goodwill and intangibles, tangible assets, tangible equity and TA/TE, 1984-2012, please see Table 4 in the appendix. It is easy to see that while banks’ profit margins have returned to pre-crisis levels, the decline in leverage (due to debt pay-downs of over $1 trillion as well as write-downs of goodwill) and revenue yield (a function of lower rates, lower investment banking revenue and the regulatory driven reduction in traditional sources of fee income) has led to a sharp decline in ROE compared to pre-crisis levels. The profit margin component rapidly recovered over this time period, surprisingly, for a number of reasons. The most obvious is the decline of interest expense (i.e., cost of goods sold), which more than offset the drop in interest income (which feeds into gross revenue) in absolute dollar terms. Another offshoot of the continuing low-rate environment has been a refinancing boom, which engendered notable increases in gains-on-sale of loans and securities, as well as fixed-income trading profits. The remaining driver of improved profit margin is perhaps the most unpredictable component of the profitability and valuation of banks: credit. Credit losses on highly leveraged assets have been the downfall of many banks through time, as was vividly captured during the recent crisis. Figure 2 shows the historical trajectory of loan loss provisions and charge-offs, and their impact on bank profitability. Banks over-earned on an accounting basis during the past three years due to the release of reserves, so we focus on what we call economic profit. Economic profit accounts for the wealth lost due to charge-offs — money lent that will never return, and gives banks no credit for reserve releases. Similarly, in years, where banks reserved in excess of actual charge-offs, banks are given credit for the actual economic loss to shareholders in that period. When adjusting for this, ROE in 2012 was 7.79%, compared to a reported ROE of 8.92%. On this basis as well as on reported ROE we see bank ROE improving but still not anywhere close to what was earned prior to the crisis. Source: FDIC, Epoch Investment Partners’ estimates. To determine economic profit, reserve releases (additions) are removed from pre-tax profit and the resulting amount is taxed at that year’s effective tax rate. For a complete data set of pre provision operating profits, loss provisions, pre-tax profits, charge-offs, net charge-offs, LLP-NCO, X/O items, economic profit, stated ROE, adjusted ROE and over (under) statement of ROE, 1984-2012, please see Table 5 in the appendix. provisions and are likely to counter FASB’s proposal with one of their own. Now that we’ve touched on credit, we turn our attention to net interest margin. NIM . . . Not improving (even) mildly? Net interest margin measures the yield on an asset less the cost to fund that asset. Bank net interest margin is a key driver of profitability and revenue yield on assets and hence has a significant effect on ROE. Sustained low interest rates, while generally helpful to bank capital markets operations, have nonetheless had a negative effect on banks’ much larger lending operations. Table 1 shows banks’ historical revenue yield, cost of funding, and net interest margin. One can see that while asset yields and cost of funds are both at historically low levels, the gross profit margin as measured by NIM is not markedly below historical levels (average of 3.6% since 1984). Thus, higher rates in and of themselves won’t create higher ROE. This can be viewed most vividly by comparing the industry’s stated ROE in 2012 with that of 1986. In both years, banks on average reported ROEs of nearly 9% though the asset turnover component of ROE, driven in large part by yields on earning assets, was substantially higher in 1986, as was leverage. The flip side of this is that profit margins in 2012 were notably higher than in 1986 due to a combination of lower “cost of goods sold” via lower interest expense and the aforementioned reserve releases, which were enough to overcome a large decrease in leverage. The fact that lower rates aren’t uniformly bad for ROE can also be seen in the mortgage market, where banks have realized record-high gains-on-sale in the secondary market due to Fed buying of mortgage-backed securities. It is true banks’ profit margins and thus ROE will benefit from the deliberate lag in the re-pricing of deposits versus a corresponding increase in asset yields (which improves gross profit margin) when interest rates increase. The timing of such an increase is difficult to predict given the Fed’s and other central banks’ determination to keep both short-term and long-term rates low. It is also difficult to ascertain how quickly the lag will be competed away by other banks and intermediaries such as money market funds. With bank net interest margins not particularly low by historical standards, higher rates, while definitely a positive for the group, would not by themselves improve ROE. In addition to the shape of the yield curve, a lot will have to do with the composition of current bank balance sheets, which we will touch on next. Why are you so (asset) sensitive? In his recent letter to shareholders, J.P. Morgan Chase CEO Jamie Dimon made a pointed statement in regards to his bank’s ability to benefit from higher rates: “As we are currently positioned, if rates went up 300 basis points, our pre-tax profits would increase by approximately $5 billion [around 15% of J.P. Morgan’s 2012 pre-tax income] over a one year period.” He is likely referring to a parallel shift in the yield curve whereby all points would go up 3%. This is unlikely, and he admits in the same letter that this is if “all things are equal,” which wouldn’t be the case. There would be dislocations in the market should such an increase occur over such a short period of time. For example, J.P. Morgan would likely face significant markdowns on its inventory of trading and available-for-sale securities. But it does point out that JPM has a lot more assets with short maturities than it does liabilities, making it a so-called “asset sensitive” bank. We have reason to believe most banks of all sizes are in this position. Figure 3 shows the composition of banks’ collective balance sheets over time. Source: FDIC. For a complete data set of FDIC-insured banks’ balance sheet composition, 1984-2012, please see Table 6 in the appendix. Three trends are visible since the crisis: 1) bank loans as a percentage of earning assets declined sharply; 2) cash and securities increased sharply; 3) deposits and equity now make up a larger share of bank funding than at any time in our data series (going back to 1984). We believe number three is permanent. Regulators worldwide have embraced the higher capital requirements embodied in Basel III (discussed later). Debt funding is frowned upon; in a recent speech Chairman Bernanke flatly stated “Notably, supervisors will continue to press banks to reduce further their dependence on wholesale funding [i.e. debt], which proved highly unreliable during the crisis.” Thus the cost of funds should decline at any given point of the cycle (debt financing is more expensive than deposits). As for the other two trends, we see nascent signs of loan growth (discussed below), and believe the huge amount of money parked in cash and shorter-term securities provide ample “dry powder” for banks to improve their ROE when redeployed into loans at a higher net interest margin. Looked at another way, were banks simply to move back to 2011’s collective NIM on their existing earning assets (i.e., an 18 bp increase in the yield on assets relative to the cost of funds), close to $15 billion of after-tax income would accrue to the industry and push its collective ROE close to 10%. It is worth noting that a provision in Basel III (a global regulatory framework for mandating minimum levels of capital and liquidity) known as the Liquidity Coverage Ratio (LCR), calls for increased amounts of cash and short-term liquid assets to be held on bank (particularly internationally active bank) balance sheets. The minimum LCR calls for enough liquidity to ensure “that banks have an adequate stock of unencumbered high-quality liquid assets (HQLA) that can be converted easily and immediately in private markets into cash to meet their liquidity needs for a 30-calendar-day liquidity stress scenario.” Banks are required to achieve 60% of the target LCR by 2015 and 100% by 2019. Thus, it is unlikely cash and securities will return to the low level they were pre-crisis, as banks begin to hoard liquidity. That said there is considerable excess in the system. For example, Citigroup (which we will discuss later in this paper), disclosed it ended the year at 118% of its 2019 LCR, which equates to $55 billion of excess liquidity over the 100% target, and roughly $31 billion over Citi’s internal 110% target. Citi’s estimates redeploying the $31 billion in higher-yielding assets or debt reduction would boost annual earnings by 2%, which implies an increase in ROE of nearly 20 bps. Keep in mind, Citi is an extreme example as it is perhaps the most internationally active of the big U.S. banks, but with 50% of domestic assets concentrated in the top five U.S. banks, the LCR (if it is applied in its current form) will play a role in the migration of funds back into lending. Domestic competitors will be less inhibited by LCR, but it is hard to imagine their not being required to hold some kind of liquidity buffer in excess of what they’ve held historically. interest rates but on loan growth. government securities. With further economic improvement the table is set for a meaningful improvement in bank balance sheet efficiency, which we define as yield per dollar of risk-weighted earning assets, i.e., the most “bang” per “buck” of funding. So how are we doing post crisis? Banks grew loans at a 2% CAGR over the past three years. In the first quarter, U.S. banks grew loans by 3.6% compared with the first quarter of 2012. Is this cause for celebration? Perhaps, but we are chastened by the fact deposits grew at a 5% CAGR (9% YOY through March) and were deployed into securities (6% CAGR, 5% YOY through March), as well as cash (11% CAGR, 19% YOY through March) at a faster rate and in higher absolute dollars versus loans. On a positive note, debt declined by an 11% CAGR (12% YOY), mitigating some of the decline in net interest margin. The liquidity buffers mentioned above, residual fear post-crisis, higher potential risk weightings, write-downs and regulatory headwinds in the mortgage market all likely played a role in addition to global deleveraging. All are likely to continue to weigh on loan demand and prevent large scale repositioning of bank balance sheets in the absence of substantial economic improvement. So things are better, but not good enough. What other levers could banks pull to boost ROE? Cost-cutting is one option, which large organizations such as Citi, Bank of America, and KeyBank are pursuing. They could also seek more asset efficient and potentially (but not always) higher margin revenue not directly tied to net interest margin, i.e., non-interest income. They could purchase or develop higher ROA businesses (including asset managers, which carry ROAs well into the double digits with little leverage). However, as mentioned earlier, many avenues of non-interest income generation have been closed or narrowed, perhaps permanently. By and large, as shown in Table 2, the industry is neither particularly “fat” when it comes to expenses, and is already earning a historically normal amount of non-interest income, especially considering regulatory scrutiny on non-interest income (Durbin, Volcker, forced-placed insurance, etc.). Thus far we’ve pointed out that bank performance has rebounded since the crisis, due largely to a favorable credit environment and lower cost of funds. Leverage is lower, thus ROE is not likely to come anywhere near pre-crisis levels. Gross margins industry-wide are on the low side but not abnormal, bank expenses are reasonably lean, and banks are performing reasonably well generating non-interest income in a tough regulatory environment. Balance sheets are positioned for loan growth and higher rates, but loan growth has been meager and it is unclear when rates will rise and if they will do so in a manner favorable to banks (i.e., a steepening yield curve). In summary, with some exceptions, there are not many levers they can pull to improve the “R” absent a rapid economic expansion. There is one element of ROE — the denominator — we have not discussed and herein lies the key to improved bank returns, aided and abetted by the Fed’s “stress test.” In the next section we will discuss how higher returns of excess capital — accumulated and ongoing free cash flow — can boost returns to acceptable levels and make bank stocks worthy investments. On February 10, 2009, less than a month before the S&P 500 bottomed at 666, Treasury Secretary Tim Geithner announced a Financial Stability Plan that included a comprehensive stress test for the 19 largest banks. The test would aim to quantify what at the time seemed to be an infinite amount of losses at the largest banks and increase confidence in the banking system, the lack of which was paralyzing the economy. Alongside the stress test, Geithner announced the Capital Assistance Plan, which would act as a backstop for banks deemed under-capitalized following the adverse scenario contemplated by the stress test that could not raise equity capital on their own. The market yawned and the S&P 500 dropped another 4.5% to 828 that day and another 20% until its beastly bottom on March 6, 2009. While the dates did not exactly overlap (the test results were not announced until April 24, 2009 when the market was well on its way to recovery), we believe the initial stress test was the single most important catalyst for the market as a whole and financials in particular. SCAP (the catchy acronym of the initial stress test) and its subsequent iterations (the CCAR and DFAST) have grown increasingly granular and stringent the past five years and in addition to banks’ improving performance each year have given us confidence that the space can no longer be deemed “un-investable.” Table 3 shows iterations of the stress test through the years (note that 2011’s results for individual banks were not published). Clearly the health of the industry has improved: pre and post-stress capital ratios are up, projected stressed loan losses are down, and the industry has gone from needing $75 billion of fresh capital to being permitted to return over half of its earnings to shareholders through either dividends or buybacks (though dividends are restricted to 30% of earnings). Equally important is the stress test’s methodology. The test has broadened the number of macro parameters it considers when assessing bank capital from a purely domestic framework focused on home prices (except for the six large banks with international trading activities) to one that encompasses market volatility, consumer inflation, and the health of all key global economies. All bank holding companies with greater than $50 billion of assets are now tested as opposed to only the 19 largest, which subjects an additional 11 institutions to scrutiny. Beginning in 2014 non-bank systematically important financial institutions (SIFIs) such as insurance companies will be added to the list. The assumptions embedded in these parameters have also grown more stringent: the 2013 test (DFAST) contemplates a 6% drop in GDP (vs. 2% in the 2009 SCAP), 12% unemployment (vs. 10.3% in 2009), a 20% drop in home prices from then current levels (vs. 10% in 2009), a 1.2% rate on the 10-year Treasury (vs. ~2.5% in the 2011 CCAR) and a 50% drop in the DJIA (vs. 28% in the 2011 CCAR). Banks have also reportedly been asked to consider a scenario of rapidly rising interest rates. There is also less of a “take home test” aspect to the stress test. In 2009, regulators were admittedly “under great time pressure” and “it was not possible to produce completely independent estimates,” according to Chairman Bernanke. Banks were given an acceptable range of predicted losses by loan category and told not to submit any estimates outside of that range unless they had good reason. Ten entities failed. Fast-forwarding to 2013, banks still submit their own assumptions of stress test losses using the Fed’s parameters, but the Fed also runs their own stress test for each bank using its own models, which are not made available to bank management. Both publish their results. Shockingly (!) most banks’ estimates of their post stress capital levels came in substantially higher than the Fed’s, sometimes embarrassingly so as in the case of Goldman Sachs (8.6% vs. the Fed’s 5.8%). Guess who won that argument? Interestingly, Citigroup, which under the 2009 test required a $5.5 billion capital infusion on top of earlier infusions of $45 billion and later massive government guarantees of its balance sheet, emerged with a post-stress Tier I Common ratio 130-250 bps higher than Wells Fargo, Bank of America, J.P. Morgan Chase and Goldman, and on par with U.S. Bancorp. The Fed estimates it reviewed individual loan and account level data on over two-thirds of the $4.2 trillion of loans and leases in the 18 bank holding company portfolios over the course of the 2013 stress test and in Chairman Bernanke’s words are “close to the point at which we will be able to estimate, in a fully independent way, how each firm’s loss, revenue, and capital ratio would likely respond in any specified scenario.” In other words, no more take home test. And the Fed also put even the perceived-to-be strongest institutions such as J.P. Morgan and Goldman on notice by only conditionally approving their capital plans, and in the case of American Express, rejecting it (AXP did use its mulligan to get a less aggressive plan approved). In our view, the increased granularity and independence embedded in the stress test is another milestone and heralds increased transparency into the “black box” nature of large bank holding companies. We now have reasonable estimates of worst case, capital consuming credit losses. The question we can now ask is the same we ask for all the companies we invest in: do these businesses generate free cash flow, how much do they generate and how are they using it on behalf of shareholders? Those are two terms that aren’t usually paired. Unlike most businesses, one can’t calculate free cash flow for a bank by simply subtracting capital expenditures from cash flow from operations. For example, a loan charged off is a “non-cash” event but it is absolutely an economic loss for the shareholder. A provision matched to this loss is an add-back to net income in cash flow from operations but represents a real, regulatory-mandated cost of business and is at least temporarily capital that cannot be distributed. Similarly, when a bank makes a loan (technically a cash outflow) equity capital must be held against that loan, depending on its risk level. This does not show up as a capital expenditure on the cash flow statement but it is capital that is not available to the shareholder until the loan is paid down. There are also regulators to answer to, that, most visibly in the stress test, dictate how much the bank is permitted to return to shareholders. Yet there are ways to estimate how much of a bank’s net cash earnings may be distributed. There are three important inputs: 1) required capital (Basel III Tier I Common) level to be maintained; 2) capital generated (net income in its simplest form); and 3) asset growth (risk-weighted). See Figure 4 for a simple model. Note the top term does not take into account the current capital adequacy of the institution or its relationship with its regulator, which if strained can lead to substantially higher capital requirements and thus lower distributions. Nor does it take into account the capital structure of its holding company, which may require earnings to fund any operating and interest expenses not borne by subsidiaries (thus free cash flow for the holding company, which is the entity we own, would be free cash flow from the bank and other subsidiaries less any holding company requirements). It only addresses the incremental free cash flow generated by the next dollar of earnings. Capital adequacy is captured in the second part of the equation. If the bank or holding company is undercapitalized, that free cash flow must be held to fortify capital. Similarly, if the entity is overcapitalized or very well capitalized, 100% of that free cash flow (plus some excess capital) may be used to fund buybacks and dividends. For example, American Express has received permission to pay out over 100% of its projected earnings in 2013 in this way. As with any model, the degree of accuracy and conservatism in the inputs are vital. For a bank, as with other companies, the first step is to estimate net income, which will make up the lion’s share of capital generated. Change in risk weighted assets is extraordinarily difficult to estimate, especially with final Basel III risk weightings yet to be agreed upon and the uncertainty regarding the mix of asset growth. Simplistically, if the bank’s business model isn’t changing significantly, we can assume the existing relationship between risk-weighted assets and GAAP assets will stay the same. Given tepid loan growth, but rapid deposit growth which is deployed into lower-risk cash and government securities, risk-weighted assets will in almost all cases grow less rapidly than GAAP assets, which ironically improves banks’ capital position and frees up capital, all else equal. On-balance sheet loan growth has averaged 0.5x the growth of nominal GDP since 1984, and almost exactly that (around 2% annually) in the 2010–2012 period. Thus, low-single-digit loan growth is the best we can expect from any large bank in the near term. The most critical governor of bank free cash flow will be its Basel III Tier I Common Ratio. This is a ratio computed using a framework set by the Basel Committee on Banking Supervision, a regulatory group consisting of representatives of global central banks. It is expressed as Tier I common equity divided by risk-weighted assets, adjusted to exclude from equity: intangible assets, certain pension plan assets and a portion of a BHC’s deferred tax assets (which may never be realized), mortgage servicing rights (a kind of intangible asset) and stakes in other financial companies. The minimum ratio to be achieved is 7% but complex, internationally active banks (G-SIFIs) must hold B3T1C as high as 9.5%. Individual country regulators have some leeway in setting risk-weightings as well as additional capital surcharges. At this point it may be helpful to show an example of how this would work in practice. Citigroup ended 2012 with B3T1C of $105 billion and risk-weighted assets of $1.2 trillion, for a B3T1C ratio of around 8.75%. It is required to reach a 9.5% ratio by 2019, though in actuality investors and regulators are demanding they get there yesterday. For conservatism’s sake, we’ve assumed Citi must build up to a 10% ratio by year-end (and 11% by 2016). Thus, there is an extra claim on Citi’s free cash flow to boost its capital, i.e., this money is not available for shareholder distributions. Morgan Stanley has projected that Citi will earn over $13 billion in 2013 (we have not assumed any “mitigating” balance sheet actions banks may take to further boost capital). Due to the ongoing sale and wind-down of different business units, Citi’s risk-weighted assets are actually projected to fall by $57 billion. In Figure 5, plugging these numbers into our equation yields free cash flow of $3.6 billion. Thus, regulator permitting, we think Citi could safely distribute $3.6 billion, or roughly 27% of its estimated net income for 2013. In future years, if we held the capital requirement at 10%, Citi could distribute a level of earnings comparable to peers, including J.P. Morgan and U.S. Bancorp (70-75%). Assuming Citi must build to 11% capital by 2016, Citi could distribute 50-55% of earnings to shareholders, similar to Wells Fargo. It’s worth pointing out that Citi could free up additional capital for distributions should it begin to utilize its massive U.S. deferred tax asset (admittedly generated by massive losses), which as it stands, is punitive from a Basel III perspective. This is likely, in our view, as loss-making operations in Citi Holdings, which contains its remaining stake in retail brokerage plus detritus from the crisis era, are wound down. Citi Holdings generated a $6 billion loss in 2012 compared to a $14 billion profit for the rest of the company. Every dollar distributed is no longer part of the “E” in ROE. Should Citi be permitted by the Fed to distribute earnings using the 11% threshold, ROE could exceed 9% and return on tangible equity of 10% by 2016, at which point book value per share and TBV/share could approach $85 and $73, respectively. Holding capital to the 10% threshold would boost returns by an additional 50 bps. A 30% payout ratio at that time would produce a $2.25 cash dividend. The two other traditional uses of free cash flow are less likely to be utilized by Citi. They almost certainly will not be permitted to buy another bank. And while they have de-levered similar to other banks, it is possible they will have to take on more expensive forms of debt under provisions of Dodd-Frank still to be determined. While Citi faces the same NIM and fee income pressures as its peers, its vast international presence (60% of 2012 profit, excluding Citi Holdings) and exposure to emerging markets, plus outsized exposure to credit cards (higher loan yields, plus fees and interchange make this a relatively high revenue turnover business) should enable it to generate better-than-peer loan growth moving forward. It also lags peers such as J.P. Morgan and Wells Fargo in its expense ratio, giving it an additional lever to pull to enhance ROE. Citi’s is the house being remodeled in a not-quite-bad neighborhood that used to be a lot nicer. Risk remain . . . The biggest risk to banks’ free cash flow, particularly the large banks, is regulatory. While Basel III and the stress test seem to firmly set a floor of capital, the question is: will that be enough? Recently, a bipartisan bill floated in the U.S. Senate proposed to raise required common equity to 15% of consolidated assets (not risk-weighted) for banks holding greater than $500 billion of assets. For banks below this threshold, the ratio would be 8%. The smallest community banks would be unaffected. If implemented (highly unlikely given the deleterious effect it would have on lending), this would eliminate distributions by large banks for the foreseeable future and reduce distributions by medium-sized banks. Our free cash flow framework would be broken. The intent of the bill is likely driven by a desire to, if not break up large banks, prevent them from getting bigger and prevent medium-sized banks from having aspirations of becoming large banks. Politicians’ intents may be (ahem) noble but we doubt they want to stymie the flow of credit. We believe the Basel III process is well on its way to making banks more sound, and additional legislation is by and large unlikely and unnecessary. The Consumer Financial Protection Bureau’s Qualified Mortgage rules could slow down the growth of mortgage lending, the single largest category of lending on bank balance sheets (25% of loans). Here too, we think politicians’ good intentions will give way to the desire to expand the availability of credit. The Orderly Liquidation Authority (OLA) provision of Dodd-Frank could, perversely, encourage banks to take on more high cost (but not total) debt by mandating more “bail-in-able” capital at the bank holding company level, in the form of subordinated debt (which would likely be used to reduce more senior forms of debt). This would hurt net interest margins. Rating agencies, particularly Moody’s, have discussed lowering holding company credit ratings should the OLA succeed in disabusing market participants of the notion the U.S. government will support large banks in a crisis and not dismantle them. In short, banks and their investors face a regulatory wall of worry. We posit that while banks are still paying for the excesses that led to the financial crisis and the current macro environment is mediocre, banks are well positioned for the next upturn, and the stress test has addressed much of our concern relating to transparency. Valuations in the sector are not stretched, with many banks trading below both stated and tangible book value, and should ROE increase there is potential for multiple expansion in certain stocks. Due to higher capital levels and less leverage, banks will become more utility-like and less risky. Ample dry powder exists on bank balance sheets, even after accounting for new regulations such as LCR. Much will depend on how quickly the economy grows, which should drive increased lending, and vice versa. In the absence of loan growth, banks will rely more on return of capital to drive adequate returns, not necessarily a bad thing in our investment framework. Provided banks continue to earn an adequate return on whatever balance sheet growth they generate — and judging by performance post-crisis and 1Q results to date, they are — they should generate excess capital, or free cash flow by another name. There are unique opportunities to play simultaneous increases in profit margins and capital distributions. Among the smaller and mid-sized banks, consolidation will take place to reduce costs, presenting a rich opportunity set in small- and smid-cap products. We note that even the acquirers’ stocks have been going up when recent deals have been announced. Our colleague John Reddan aptly titled a prescient report on financial stocks in 2005 “The Wheels Are Coming Off.” In the U.S., the wheels have since been repaired, and there is now a governor in place to prevent banks from exceeding their speed limit. They are now boring, but potentially functional entities for investors focused on free cash flow. Table 4 depicts system-wide assets to equity of all FDIC banks since 1984, the earliest date for which we have complete combined data for commercial banks and thrifts. (b) Uses average quarter end asset balances from 4Q of previous year through 4Q of current year. (c) For 1984-1995, uses quarter end balances from note (b) to calculate, as FDIC did not publish a single consolidated number for commercial banks and savings banks. Source: FDIC Quarterly Banking Profiles, Epoch Investment Partners’ estimates. (c) Reserve releases (additions) are removed from pre-tax profit and the resulting amount is taxed at that year’s effective tax rate. Source: FDIC, Epoch Investment Partners’ estimates.